Published on October 15, 2009 by Wade Shepard Follow me on Twitter here. If you are going to “do” a country, be sure to do it right. From my figures, a traveler only needs three things: transportation, shelter, and sustenance (food and water). Acquiring these resources requires a different strategy for each region of the world. To travel cheaply I know that I need to match my travel strategy to the region I am traveling in. When I land in a new country, I look around a little, kick at the dirt, poke myself in the belly button, and then figure out the waves of the water, the wind in the sky, how to get from point A to B, how to eat and sleep as cheaply as possible. Street food — cheap and prepared OK.
Bicycles — cheap and available. Road conditions for bicycling — horrid. And so on and so on and so on until I develop a traveling strategy that suits a particular region of the world as well as my pocketbook and preferences. In India, I travel by train — it is cheap, the stations are wild, kaleidoscopic, moving villages, and the rail lines have the subcontinent covered, prefer to buy food from markets and prepare it myself, and sleep in cheap hotels. In Western Europe I would never dream of traveling regularly by train — to do so would mean slicing out the bottom of my pockets and watching my pennies fall into the black hole of money wasted — and I instead opt for a bicycle with a milk crate gear basket tied to the back. I buy my food from markets and cook it myself or eat fast food, and I trade webpages for free accommodation in hostels or camp out on the sly in a tent. In Central and South America, I take the bus– they are easy, cheap, go almost everywhere, and I can get on and off them wherever I want to. I eat in cheap restaurants or on the street. I sleep in hostels or cheap hotels (sometimes trading for free accommodation). While in East Asia, I seldom take the bus because the hitchhiking is just too good to pass up or I take the train in China and Japan. I ride bicycles for local transport. I eat in cheap restaurants or buy food in markets to prepare for myself. I sleep in hostels or cheap hotels or outside. I found that The best way to get around Mongolia is by jeep or motorbike, to buy food in markets or at restaurants, and sleep in visitor gerts. If I went to Europe and stayed in hotels, ate in restaurants, and rode the train, my daily bill would be over $100, and I have severe doubts as to what I would really experience. I am now looking around the USA, trying to figure out my battle plan. If I were to make a suggestion to a foreigner as to how to travel my country, I would 100% recommend buying monthly Greyhound passes and interspersing bus travel with hitchhiking. I would say that someone should Shamedog it between the population centers that Greyhound services, and then hitchhike to places that lay beyond. But my circumstances are different, I need another strategy. The ground rules: my family will be here next Thursday night, I have a small car, I want to continue working archaeology projects, I want to save up enough money to purchase a sailboat, I want to stay west of Texas and south of Wyoming. I want to stay in the USA for the next two months and then travel onto El Salvador for the winter. These are my terms, and I want to stick to them. How to travel in the USA with my family? This will require a decent amount of tact. Hotels are expensive in this country: a ragged room in a Curry Inn will take out $35 a night, and those $20 dorm beds are no longer applicable for a man with a two month old baby and a wife. Trains in the USA are unfortunately expensive and severely unreliable. The buses of the USA are hit and miss as far as prices, but the Silver Dog is no place for a baby. To keep my plot the same I need to shift my strategy to meet my shifting circumstances. To travel with a family I believe that it would best be done with my own means of transportation that could also serve as our shelter. A traveler needs to pay for three things, and three things only: transportation, shelter, and sustenance (food and drink). All else is free or bottom of the barrel cheap. To have a form of transportation that can also serve as my family’s shelter must now be my means for getting around the world. The entire mission to acquire a sailboat and travel by sea is for this purpose (though Petra is a little too much on the mushy side for this now, in a year she will be a little more solid and could be stashed below deck when Chaya needs to help man the ropes — the Sailing project has been put off for one year). But what now? In the USA, in the middle of the dry land of a big continent. I am in the West, a region of long roads, high mountains, salt lakes, deserts, oases, cattle ranches, cacti, dry washes, rivers, no man’s lands oh my. What strategy should be employed to travel this region? Perhaps, I should commandeer a land yacht. The cotton ball headed wandering pensioners have found a diamond in the mineshaft for traveling in the USA: the RV. What could be better in this land of roads and highways than a truck that you can live in like a home? A land yacht that can take you over the dry seas of America: you can drive ’em, sleep in ’em, and, if you are tactful and meticulous, park ’em through the night for free. (“You know, Boss, I have a family so I really need my own hotel room. Is this in the budget?” No way). RVs are going cheap these days. 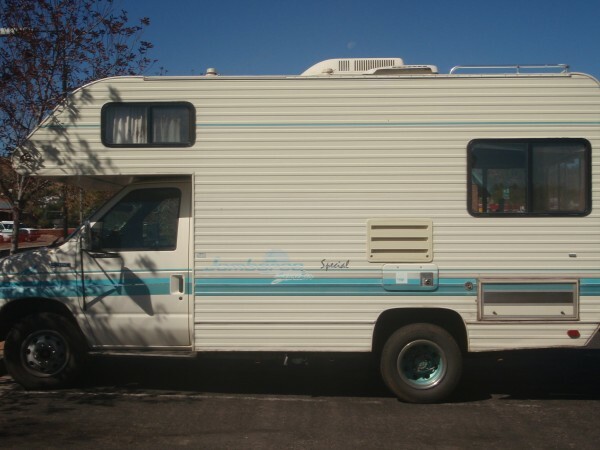 My intention behind buying an RV would my usual strategy for tending a motor vehicle in the USA: I buy ones that are so old that the resell value has bottomed out, use them for a few months, and then sell them when I am ready to leave the USA for what I paid. I am looking. It just so happens that I am told that Phoenix is one of the best places in the USA to pick up a cheap RV in the country. We will see. It would be good strategy to travel this country. We will see. I will set out my net just to see what swims into it. Maybe it will come up full, maybe I will real it in empty. That’s funny. My man and I were just talking about what we might do to sell everything and take to the road. We’d never thought ourselves RV people before, and the man’s not much of a traveler, but somehow we found ourselves in a big lot, shopping for what could be a new home. The fancy has since fleeted. We’re looking for something in our lives to change. This may not be our answer. But for you, I’m really liking the way you’re thinking. Sometimes just seeking out and searching the waters for change is stimulation enough to satisfy the change urge. But sometimes you have to cut off everything and get out and end up on some far corner of the world. Let me know how you get through this period of flux — well, I suppose you never can get through the flux — but let me know if the change urge drives you and your man to some far flung island somewhere. I will come and visit!